What do CEOs, presidential candidates, and the CIA director have in common? They both know that email security is easily hacked! In the past few years, there seems to have been scandal after scandal involving someone’s email getting hacked. The major ones to hit the media have involved prominent political figures or high-level executives, but there are more hacks every day that don’t hit the news cycle. If someone can hack into the email of the CIA director, how hard would it be to penetrate your company’s email system? With the digital age, it has become easier and easier to share information. So when a supplier or partner asks for the latest updates to your product design, legal documents, or other confidential information, it’s no problem to send them what they’re asking for using Outlook or any other email platform. But what employees don’t realize is that they are putting your intellectual property at risk by using this type of platform to exchange data. For secure data exchange using Outlook, it is best to integrate an enterprise file synchronization and sharing (EFSS) system, Managed File Transfer (MFT) solution or some type of web based portal directly into the email system so email security is easy and reliable. Employees can securely send large files, that are protected before they even leave their computer. These portals are integrated directly into the workflow so it doesn’t inconvenience the end users. 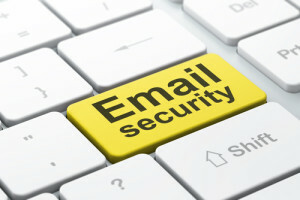 ​If you’re worried about your email security, and your intellectual property stolen, look into a secure data exchange portal that integrates directly into your email system so that employees are more likely to use it. Test a few free trials out, and see which system integrates best into your workflow.